Why not make your trip to Santa’s Enchanted Castle extra special with an overnight stay in one of the Enniscorthy Hotels. The Riverside Park Hotel and Treacys Hotel and Slaney Suites have excellent packages available included are tickets to the Enchanted Castle. So enjoy your overnight stay, take some time for Christmas Shopping around the town of Enniscorthy and enjoy a relaxed meal in any of the town’s excellent restaurants. You can book directly online below; limited availability so advice is to book early. The warmest of welcomes awaits you in Treacys Hotel Enniscorthy, where you will be treated to gracious hospitality and a superior standard of friendly and personal service. 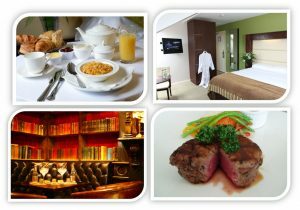 Treacys Hotel Enniscorthy, one of Wexford’s most charming hotels, balances old world elegance with modern glamour and is perfectly situated in the bustling town of Enniscorthy, Co Wexford which generates a hub of activity. Our Santa’s Midweek Sleepover Package is priced at just €159 per Family (2 Adults & 2 Children). If you have more than two children in your family then the additional rate per child would be €30. We would be delighted to welcome you to Treacys Enniscorthy this Christmas to experience the magic of Santa’s Enchanted Castle. We are also offering a 20% early booker discount by using the discount code SANTA on our website. Offer available on all dates (including weekends) only valid until the 10th September. Address: Templeshannon, Enniscorthy, Co. Wexford, Y21 T2F4. Stay with us at the luxury 4 Star Riverside Park Hotel and treat yourselves to a magical Christmas stay. From the children being welcomed with a Hot Chocolate on arrival and being dazzled by the twinkling lights to you relaxing in the Prom Bar you will be spoilt throughout your stay. With free use of our leisure centre with indoor Heated Swimming Pool, Children’s Pool with bubble seat, Steam room, Sauna and Jacuzzi to the playgroup adjacent to the hotel you will have plenty to do throughout your stay here at the Riverside Park Hotel. We have three dining options to choose from, the Alamo Steak House, The Moorings Restaurant and the Prom Bar there is something for all the family. 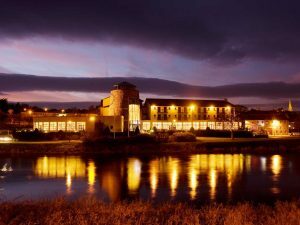 Our hotel is situated on the picturesque banks of the River Slaney, on the outskirts of Enniscorthy town. Superbly located for Santa’s Enchanted Castle, only a 5 minute walk from the hotel. We also have packages including dinner, to book or for further information please contact us directly. Address: The Promenade, Enniscorthy, Co. Wexford, Y21 T2F4.